The Elephant Coast Guesthouse is situated in South Africa, in the heart of Kwazulu – Natal’s north-eastern coastal region, one of the jewels of the Zulu Kingdom. This luxury guesthouse is ideally located in the picturesque town of St. Lucia, Gateway to iSimangaliso Wetland Park bestowed with UNESCO World Heritage status in 1999. This amazing safari and holiday destination of exceptional beauty combines the best of both land and marine nature environments. Elephant Coast Guesthouse is set amidst a subtropical garden neighbouring the St Lucia Nature reserve. We are often visited by resident wildlife. Hippos, bushbucks, porcupine, small antelope, mongoose, monkeys, bushpigs and lots of feathery friends. All the spacious rooms are decorated in a modern African style, with aircondition and ceiling fans. It offers a haven of elegance and comfort, to retreat to after your daily activities. Double rooms, Twin or Triple rooms and Family units are available, with private bathrooms (bath or shower), tea/coffee making facilities, small fridges, hairdryers, beach/swim towels, toiletries/bathroom amenities. Outside doors opening onto a private patio for you to sit and enjoy the garden and gaze in wonder at the incredible night sky. 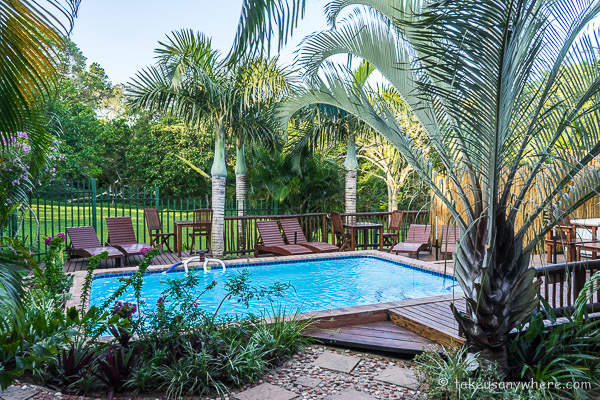 You can relax and unwind at the sparkling pool and guest are welcome to use the free Wifi internet access available throughout the guesthouse. A delicious buffet breakfast is served on the patio overlooking the garden, indigenous trees and nature reserve. Lunch and dinner are not a problem as St Lucia boasts with a variety of restaurants, within 5 minutes from the Guesthouse. We have a tour-desk where we can plan and book your excursions for you. Big 5 game drive, night game drive, sunset tour, hippo & croc tour, bird watching, kayaking, cycling, culture village tour, turtle tour, whale watching, marine mammal tour, deep sea fishing and horse riding. The Elephant Coast Guesthouse team would feel privileged to help you make your dream holiday of a lifetime come true. Came and experience the unique richness of this very special World Heritage Site.